Baby Food Myths - Expert's Guide on Choosing the Right Food! From the time a baby is born, a mother is also born. It is only natural for you to be worried and concerned about every little thing about your little one. Whether you baby is eating well or not could be your biggest worry in the initial few months. The information given by friends, relatives and what all you read could be rather confusing. Once your little once is 6 months old, weaning him or introducing food to 6 month old will be an area that you will need advice. This article will help to clear all baby food myths you have as we will discuss in detail the myths that are associated with infant feeding and their actual facts. (1) Formula Feeding: One of the most common baby food myths surrounding bottle feeding is that if the baby is constipated due to it, then you ought to switch to a low iron formula. FACTS: The fact is that the iron content of formula does not affect the bowel habits of the baby. Low iron formulas or introduction of cows milk before the age of one, can lead to iron deficiency anaemia in babies. Breast milk is the best thing for babies and the iron content in it is quite low. Newborn formula feeding may constipate the child at times as it is comparatively difficult to digest. 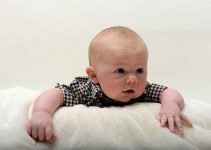 Follow a baby formula feeding chart which will tell you exactly how much formula the baby needs per feed at each month. Older babies can be given prune juice to help relieve the constipation. (2) Introducing Solids to the Baby: Many believe that when the baby is weaned off and solids are introduced; only jar foods must be fed to the child. Starting baby on solids should be a gradual and systematic process and one should never rush if the child is not ready. You can wait a week or two and try again. FACTS: Jar foods are a convenient way of feeding and baby food companies make sure the foods served are hygienic, but it is not the only method. You can give healthy homemade baby food by trying out different fruit and vegetable combinations freshly pureed at home on a daily basis. Cooking for baby recipes are easily available online these days. The best first food that should be introduced is rice cereal. Initially you could prepare it a bit runny and give cereal in baby bottle. After a few weeks, you can thicken up the consistency and feed it with the help of a bowl and spoon. You can begin by introducing boiled and pureed apples, peaches, pears, carrots, potatoes, sweet potatoes, bananas, avocados and peas. 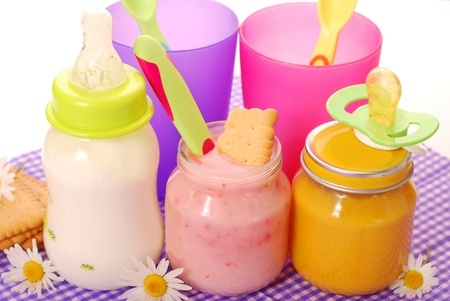 Yogurt and fruit purees mixed with yogurt are also other best foods to introduce to baby. The thumb rule is that whenever you introduce a new food, it should be done one at a time for at least three days so that if it does not suit the child or causes an allergy, you are able to identify it. Gradually as the child gets older, you may not continue feeding a baby. Try baby led weaning and let your baby explore different textures and tastes. Give him the food on his high chair and let him feed on his own. You can also stop making purees and begin to give small chunky foods that are soft and well boiled. This can be followed by larger chunks and finally by the age of one the child should be able to eat what is made for the entire family with less salt, sugar, chilly or oil as per what your baby likes. 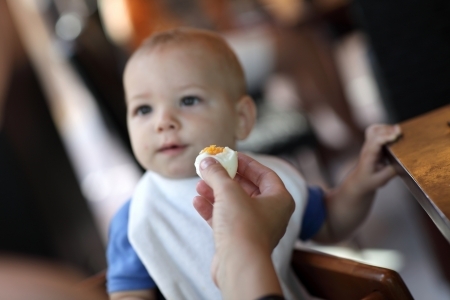 (3) Eating Meat and Eggs: Another common baby food myths that a lot of parents follow is that eating eggs and meat regularly is unhealthy for babies. FACT: The fact is that in the growing years, all the protein that the child takes only helps him grow better. Meat and eggs are a wonderful source of iron, zinc and protein. After 9 months you can introduce meat, chicken, fish and beef that is well cleaned, boiled and cooked. It should be chopped up very finely in the chopper to make small pieces that are soft so that the baby can chew them. These foods can be served upto few times a week. Some caution that you need to maintain is look out for allergies and try giving only cooked eggs rather than runny ones. Avoid giving canned meats or hamburgers. Prefer only home cooked delicious food for the baby. (4) Food Rejection: It is a myth that if your child rejects a food at one point, she will never eat it. FACT: The fact is that children like to eat what they find comfortable over and over again. Trying something new is more a matter of surprise and the unknown rather than actual rejection. If your toddler rejects your home made tortillas, don’t fret as he or she may need to have a new food at least 15 times before actually liking it. So just keep offering them new items and club them with their old favourites. Make a list of homemade toddler food and ask your child to choose from the list, this way they will generate an interest in the new item. (5) Allergic Foods: It is a myth that the baby should not be fed any kind of allergic food till they are one year old and preferably even after that. This helps to prevent food allergies in them. It is not advisable to give cow’s milk to babies under the age of one as it is deficient in nutrients and can cause iron deficiency anaemia and allergies in the child. Yogurt and cheese being milk products can be safely given to children as one of the first foods without any problem. FACT: The fact is that exposing the child to allergic foods does not cause or initiate allergies, but it does help you to identify at an early age what does not suit your child. 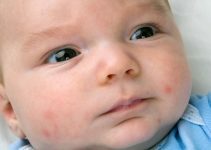 If there is a history of allergies in the sibling or a previous allergic attack in the form of eczema, then you should talk to your doctor before introducing solids to the baby. (6) Liking for Sweet: Lastly, the last of all baby food myths that keeps the parents worried is that feeding your baby fruits purees can cause a sweet tooth in the baby. 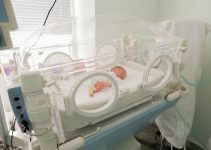 The fact is that all babies are born with a liking for sweet and that is the reason their first food-breast milk and formula are slightly sweet. Giving babies sweet purees cannot cause a sweet tooth as they already have one. What you can do is introduce them to a wide variety of food tastes and textures. Give them cereals, pulses, vegetables and meats so that they derive nutrients from each of them. Follow a balanced diet that comprise of all of the above in balanced proportions each day with different food combinations. Encourage your baby to try out new things and offer them lots of finger foods. It is common for babies to show initial rejection but after a few times, they begin eating everything.